​Image Comics is thrilled to announce that the debut issue of W. Maxwell Prince (ONE WEEK IN THE LIBRARY) and Martín Morazzo’s (SNOWFALL) genre-defying anthology series ICE CREAM MAN is being rushed back to print in order to keep up with overwhelming customer demand. 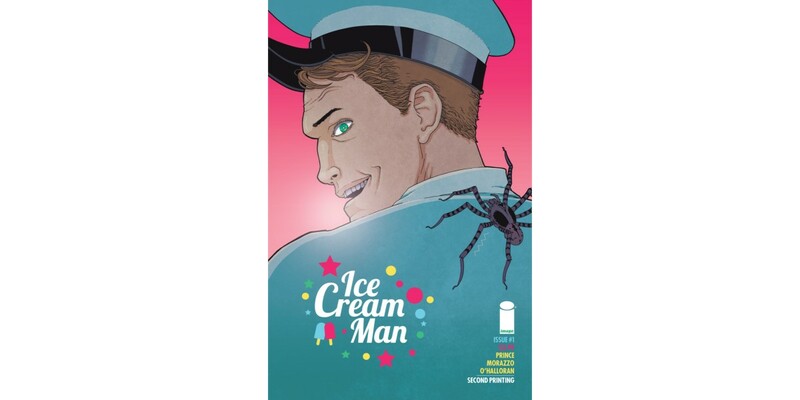 Image Comics is thrilled to announce that the debut issue of W. Maxwell Prince (ONE WEEK IN THE LIBRARY) and Martín Morazzo’s (SNOWFALL) genre-defying anthology series ICE CREAM MAN is being rushed back to print in order to keep up with overwhelming customer demand. Each installment of ICE CREAM MAN features its own cast of strange characters, each dealing with their own special sundae of suffering. And on the periphery of all of them, like the twinkly music of his colorful truck, is the Ice Cream Man: a weaver of stories, a purveyor of sweet treats. The man who, with a snap of his fingers—lickety split!—can change the course of your life forever. ICE CREAM MAN #1 will remain available for purchase across all digital platforms, including the Image Comics website (imagecomics.com), the official Image Comics iOS app, Comixology’s website (comixology.com), iOS, Android, and Google Play. ICE CREAM MAN #1, 2nd printing (Diamond code: DEC178074 ) will be available Wednesday, February 14th. The final order cutoff deadline for comics retailers is Monday, January 22nd.